Initial reports indicated that it could possibly have just been a blown speaker, but it appears that an explosion has occurred at Manchester Arena in the UK this evening. Concertgoers fled what is being reported as an explosion that shook the building. 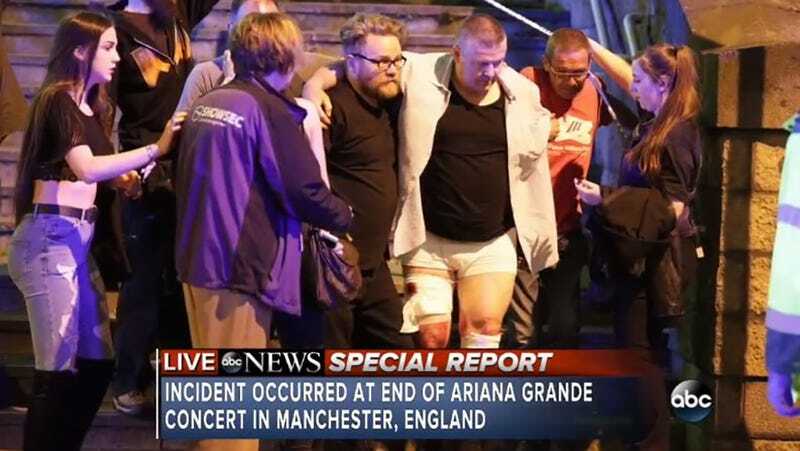 Now, police have confirmed multiple fatalities and injuries occurred at a concert by the singer Ariana Grande. Details are still scarce about what exactly occurred. What’s believed to be some type of explosion occurred as the concert was finishing around 10:30PM local time. A concertgoer named Hannah Dane tells The Guardian that there was “quite a loud explosion heard from inside the Manchester arena and it shook, then everyone screamed and tried to get out.” Another attendee named Sasina Akhtar told The Manchester Evening News, “We saw young girls with blood on them, everyone was screaming and people were running.” Police warned people in the area to stay away from the arena. Moments later, the Greater Manchester Police tweeted that fatalities and injuries had occurred but did not indicate what exactly caused them. Grande was confirmed to be “okay.” At 8:10PM EST, the GMP tweeted that, so far, 19 people have been confirmed dead and 50 have been injured. Ariana Grande is a pop star who gained fame on the Nickelodeon network and is particularly loved by younger audiences. Many people on Twitter are urging parents who have been separated from their children to contact the nearby Holiday Inn at 01618369600.